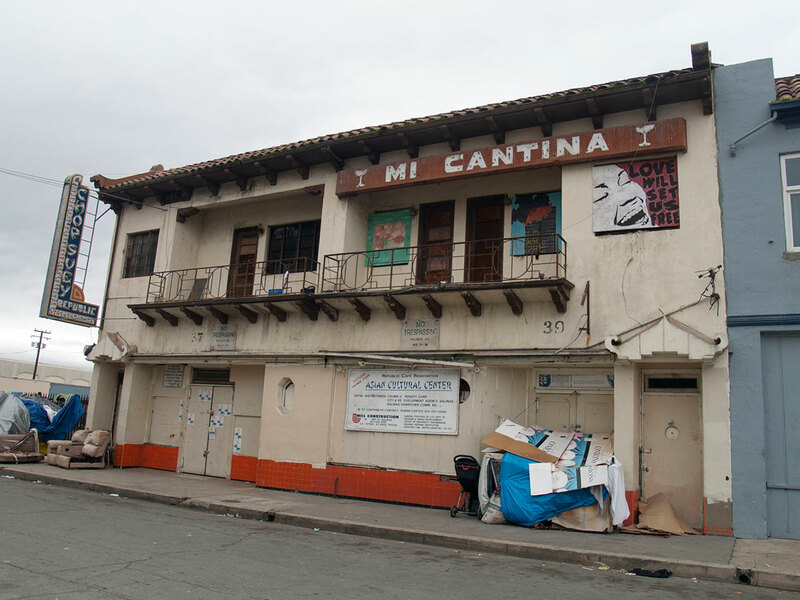 Salinas Chinatown, a six block, twenty-nine acre neighborhood, is a refuge for members of our society who have been marginalized and discriminated against. Taylor Farms, the world’s largest producer of cut vegetables and salads, built their new five-story headquarters in Oldtown Salinas, with a view of Chinatown. Taylor Fresh Foods (known as Taylor Farms) supplies processed produce to many of the largest supermarket chains and foodservice restaurants in the United States, including Darden Restaurants (whose holdings include the Red Lobster, Olive Garden, and Seasons 52 chains), plus Chipotle, McDonald’s, Subway, KFC, Long John Silver’s, Pizza Hut, and Taco Bell. According to information previously available on the Taylor Farms website, Taylor Farms has regional processing plants in the following locations: Salinas, California; Tracy, California; Gonzales, California; Yuma, Arizona; Dallas, Texas; Colorado Springs, Colorado; Smyrna, Tennessee; Orlando, Florida; Annapolis Junction, Maryland; Swedesboro, New Jersey; Chicago, Illinois; Kent, Washington and San Miguel de Allende, Mexico. Mike, a man living on the streets of Chinatown, replied “Taylor Farms” when asked where the pressure on homeless people was coming from. In 2015, Taylor Farms, the world’s largest producer of cut vegetables and salads, built a five-story building in the middle of Oldtown Salinas for their corporate headquarters. Mike explained that Taylor Farms entertains guests from around the world and they don’t like looking down during their BBQs on the fourth floor outdoor patio with panoramic views and seeing homeless people living in Chinatown. Taylor Building. Taylor Farms’ new 100,000 square foot corporate headquarters. The grand opening of Taylor Farms’ new 100,000 square foot corporate headquarters coincided with hosting the first-ever “Forbes Reinventing America: The AgTech Summit” in July 2015. Featured speakers at the invitation-only conference included Dr. Robert Fraley, Vice President & Chief Technology Officer of Monsanto; Neal Gutterson, Vice President Agricultural Biotechnology of DuPont Pioneer; Bruce Taylor, Chairman and CEO of Taylor Farms; Kevin Murphy, CEO of Driscoll’s; Garland Reiter, CEO & President of Reiter Affiliated Companies, among many others. The Taylor Building is prominently featured as a case study in the Salinas Downtown Vibrancy Plan. The Taylor Farms corporate headquarters building being constructed on the 100 block of Main Street represents a significant investment in downtown Salinas. Once complete, over 350 employees will work in the building, representing a new client base to downtown restaurants and shops. The headquarters will also bring out-of-town visitors who travel for corporate meetings. Parking and retail uses are also included with the project. This development represents the type of project that the Vibrancy Plan hopes to attract to downtown. Currently, the ITC (Intermodal Transportation Center), Bataan Park, and Chinatown are three separate areas, like islands, with no clear connection to Downtown (the mainland). A key component of making downtown vibrant is unifying these three spaces within the urban heart of the City of Salinas so they function together as one site. The first step in generating the reconnecting energy is to build upon the 2010 Chinatown Rebound Plan. Specifically, to look at how it reconnects Chinatown to downtown at Pajaro Street and East Market Street via an at-grade pedestrian and bicycle crossing. At present, Chinatown is not a safe or desirable destination for visitors due to homelessness and substance abuse. This area needs attention so that it’s rich history and unique architecture can become an asset to the area. The 2010 Chinatown Rebound Plan is a 114-page document filled with great ideas, recommendations, designs, studies, examples, charts, photos, statistics, facts, goals, and plans. However walking through Chinatown in January 2016 and speaking with people living on the streets, it appears that very little progress has been made for the community’s cultural preservation or to improve the conditions of people living on the streets. In October 2009, the community celebrated optimistically with a lighting ceremony of the “Chop Suey” neon sign at the Republic Café on Soledad Street. The plan calls for the historic Chinese restaurant to be restored as the Salinas Chinatown Cultural Museum. Republic Café and Mi Cantina. Future site of the Salinas Chinatown Cultural Museum. The Republic Cafe, built in 1942, was the response of the Ahtye family to the area’s growing need for a large restaurant capable of hosting frequent gatherings of up to 150 people. The building and the history associated with it portray perfectly the unique and complex past of Salinas Chinatown. Through the building, we get a glimpse of a bustling past where the restaurant offered both banquet feasts and small, private, curtained booths, providing a gathering place for the Chinese, Japanese, and Filipino communities to celebrate their cultural heritage. When the Federal Urban Renewal Program arrived in Salinas in the late 1950s and early 1960s, many of the buildings in the Chinatown area were declared unsafe, and consequently torn down. The Republic Cafe withstood the test of time and customer loyalty. It was one of the last active businesses in the district prior to its closing in 1988. On July 14, 2011, the Republic Café was listed by the National Park Service in the National Register of Historic Places. In 1934, a Bonsho bell, the largest of its kind in the U.S., was hung in an open bell tower at the Buddhist Temple on California Street. While the Salinas Downtown Vibrancy Plan respectfully acknowledges that Chinatown has a “rich history and unique architecture,” neither are mentioned on the “History of Salinas” page on the City’s website. Regrettably, Salinas Chinatown is only mentioned briefly on the website operated by the Monterey County Historical Society, a non-profit organization based in Salinas. Fortunately, successful efforts have been taken to wonderfully document Salinas Chinatown’s history. The following narrative written by Asian Cultural Experience (ACE) is republished here in an effort to share important cultural history which can be difficult to uncover. Salinas Chinatown is an historical “gold mountain.” Established on Soledad Street in 1893, after the first Chinatown burned down, Salinas’ Chinatown is the largest extant Chinatown between San Francisco and Los Angeles. It is an important crossroads in California immigrant history. It was home to successive waves of immigrant labor that formed the backbone of California’s agricultural economy: Chinese in the 1860s, Japanese in the 1890s, Filipinos in the 1920s, and Mexican “braceros” in the 1940s. These ethnic communities coped with marginalization and discrimination as they coexisted and sought to establish homes and livelihoods as immigrant laborers. As these communities dispersed with urban renewal in the 1970s and 80s, Chinatown suffered deterioration. Thriving businesses closed and buildings were boarded up. This tiny enclave contains a ‘root’ California story that is little known within and outside the local community. If walls could speak, this rundown neighborhood on the other side of the railroad tracks from Main Street would tell a rich multi-ethnic story of agricultural development, labor movements, daily life and low life, celebrations and struggles, collaboration and tension, discrimination and solidarity. The story of Chinatown’s past gives insight into contemporary struggles around immigration, integration, and socio-cultural marginalization, through the persistence of inter-ethnic ties and collaboration in the present. Housing the homeless requires political will and a lot of cash, but is it doable? “Welcome to Oldtown Salinas. est. 1856” was painted on the train trestle over North Main Street in July 2008. View of Chinatown, in the background on the other side of the tracks, from the Monterey Street Parking Garage on E. Market Street in Salinas. John Steinbeck mural outside the National Steinbeck Center in Oldtown Salinas, across the tracks from Chinatown. The mural features images from books and films including In Dubious Battle , Pastures of Heaven , Travels with Charley , Tortilla Flat , Viva Zapata! , Cannery Row , The Grapes of Wrath , East of Eden , and The Red Pony . Taylor Building. Taylor Farms’s new 100,000 square foot corporate headquarters. Bataan Memorial Park, a triangular park on an incline situated between Market Street, Main Street, and Monterey Street in the middle of Salinas, was created to honor the 105 Salinas and Pajaro Valley military members who fought in the Philippines during World War II. The sign pictured was made by Ty Brooks of Sunset Customs, metal design solutions of Salinas, and installed in October 2012 as part of the Bataan Memorial Park Revitalization Project. In the early 1870’s, Southern Pacific built a coastal railroad route from San Francisco to Los Angeles. The route was extended from Pajaro Junction to Salinas on November 1, 1872. (Monterey County Historical Society). The Monterey and Salinas Valley Railroad was the Salinas Valley’s first steam powered railroad to service Monterey. It was chartered by members of the Patrons of Husbandry, also known as the Grangers, on February 26, 1874. (Monterey and Salinas Valley Railroad Museum). The former Copacabana club at 115 East Lake Street in Salinas Chinatown was a popular dance venue for many years before closing sometime around 2010 or 2011. Elsa Urbina Quintero is a kind woman from Guaymas, Sonora, Mexico. From inside a tent in front of the former Copacavana club on East Lake Street, Elsa said she has been living in Salinas Chinatown for 20 years, and that she does not use drugs or commit crime. Elsa said she migrated from Mexico 59 years ago. Salinas Chinatown. On this site four lots were leased by Chinese merchants to begin construction of Salinas’ second Chinatown in 1893. John Steinbeck was the first author to write about this Chinatown in his novel East of Eden . Salinas Chinatown is also in Lani Ah Tye Farkas’ Bury My Bones in America and Carlos Bulosan’s America Is in the Heart . The Service Learning Institute of California State University Monterey Bay developed a public green space and community garden on an abandoned lot, replacing urban neglect with beauty, nutritious food, and employment. The Garden was established by dedicated local marginalized individuals through a job-training program started in 2006. This 24,000 sq. ft. site, the Chinatown Community Garden, is where people come to grow food. Garden beds at the Chinatown Community Garden in Salinas are adopted by residents of the neighborhood and organizations. Each person or organization who adopts a bed takes care of and receives the bounty of their own harvest. The property at 10 Soledad Street in Salinas Chinatown has held potential for a long time with various plans of converting the building into a homeless service center. In January 2016, it appears that the status of the property has remained the same. The Chinatown Community Learning Center of Salinas, opened in 2006 and located at 22 Soledad Street, is a project of the Service Learning Institute at California State University Monterey Bay. A mural on the outside wall of the Chinatown Community Learning Center of Salinas located at 22 Soledad Street. Dorothy’s Place is located at 30 Soledad Street in Salinas Chinatown. For more than three decades, Dorothy’s Place, operated by the Franciscan Workers of Junipero Serra, has been dedicated to serving people who experience homelessness, poverty, and marginalization in Monterey County. Intersection of Soledad Street looking down Market Way, which parallels the railroad tracks in Salinas Chinatown. Market Way, pictured, is currently a one-way street. The 2010 Chinatown Rebound Plan recommends converting streets from one-way to two-way operations, starting with Soledad Street as the “Main Street” of Chinatown. A man walks up Market Way towards Soledad Street in Salinas Chinatown. A rug and clothing hangs out to dry on a new wrought iron fence surrounding the triangular property on Soledad Street, Market Way, and Bridge Alley in Salinas Chinatown. The lot was previously utilized by homeless people living in tents. A private security guard hands someone a pair of shoes which had been drying on a fence along Bridge Street in Salinas Chinatown. Lots previously utilized by homeless people in Salinas Chinatown, such as this one on Bridge Street, are now fenced off with signs declaring private property and no trespassing. A private security guard removes a tarp, used as protection from the elements, hanging on a fence along Bridge Street in Salinas Chinatown. A private security guard removes clothing and other items hanging on a fence along Bridge Street in Salinas Chinatown. Some residents of Salinas Chinatown live in vehicles parked on Bridge Street. Frank Sr., pictured, restores an old Ford with his son Frank Jr. For more than twenty-five years, they have been working on cars in their garage at the corner of Bridge Street and E. Lake Avenue in Salinas Chinatown. The Salinas Police Department mounted surveillance cameras to a utility pole on Soledad Street and Market Way in Chinatown. As identified in the 2010 Chinatown Rebound Plan, a wrought iron fence and railroad tracks running along the southern edge of Chinatown make access to and from the neighborhood a significant challenge.